Because being hit and killed by a car wasn't bad enough. The attention-craving brewers at BrewDog have now completely confirmed my suspicions – they care more about media attention than brewing great beer. It started with Tactical Nuclear Penguin, a 32% ABV brew that tasted like paint thinner poured into a poorly brewed stout. This “zany” big brew got them all sorts of attention in the media and the blogosphere. 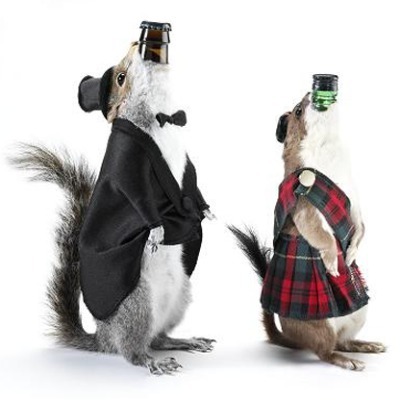 The fact that Martin and James dressed up in penguin suits to announce the beer probably helped. Soon after TNP launched, it was eclipsed by a 40% ABV beer by Schorschbraeu. Then BrewDog fired back with their 41% ABV response, Sink the Bismark. It too was a deeply compromised beer, a brewing stunt created for the glory of the brewers, not the pleasure of craft beer fans. Sink the Bismark didn’t get the same level of buzz that the launch of Tactical Nuclear Penguin enjoyed, probably because the “extreme beer” story had already been told and the mainstream media had moved on. What’s an attention whore to do? The answer is The End of History, a 55% ABV ale packaged in animal carcasses. No one can ignore a mega-beer packaged in roadkill, right? The media will go nuts for this, right? Right. The gang at BrewDog have once again gotten their faces in the paper, and once again it’s for all the wrong reasons. Congratulations fellas. Let me say for the record that BrewDog’s standard beers are just okay, not great. I don’t buy them because they are pricey and there are quite a few domestic offerings that are less expensive, better made and better tasting. I really don’t think these guys have the credibility to brew these “stunt” beers and still command the respect of craft beer fans. If all their beers were amazing, then I’d say go for it. But they’re not. They’re average. Now if Dogfish Head or Avery or The Bruery or Southern Tier decided to brew an extreme beer, I’d be intrigued, because I respect their brewing chops. Still, I don’t think any of them would feel the need to stuff it into a dead sloat (the charming brown fellow on the left). I was going to let The End of History go by without writing about it because I didn’t want to give BrewDog another scrap of exposure. But it’s been working on my brain all weekend and I had to get it out, so here it is. If I had any doubt that BrewDog cared more about the media than the people drinking their beers, I don’t now. The guys are using craft beer for glory and profit and aren’t really giving anything back. I’m 100% done with BrewDog. They can keep their roadkill. Yeah, I’m so done with these guys. I tapped out after TNP, aghast that a brewer would actually put that awful brew into the marketplace. But stuffing an even more high-octane disaster into a dead animal really takes it to a new level (a low one). If I didn’t know better I would think that BrewDog and Schorschbraeu were collectively agreeing to all these one ups of each other just to get their names out there. But who knows. I wrote an article a little while back when I tried both TNP and StB about how I felt they weren’t beers any longer getting up that high. I feel the same on this one and I haven’t even tried it. Sure it uses traditional brewing ingredients and techniques but then the act of eisbocking that they did with the 2 previous ones, and probably with this one too, is not traditional. If anything it is a lot like distilling. Getting rid of the water and leaving the alcohol behind. Hell whisk(e)y even starts off as beer before it is distilled to whisk(e)y.
I’m all for artsy and extreme brews. But you can only push the boundaries so much before you cross over that boundary into something completely different. I don’t hate BrewDog for this. I will still drink Paradox and Tokio when I have a chance too but I do find this as too far out in the extreme beer genre. If you want to make liquors just make liquors. This could be a new style of liquor or alcohol making technique. Other breweries make liquor too, like DFH and Rogue. But I have a hard time calling this beer. I loved Utopias, even though it as more like brandy than beer, so “extreme” brews can be done right. I’m all for experimenting, but don’t share it if it’s not wonderful. So far the BrewDog offerings are awful. I think any brewer can brew a mega-ABV beer, but few would want to put their name on the result. 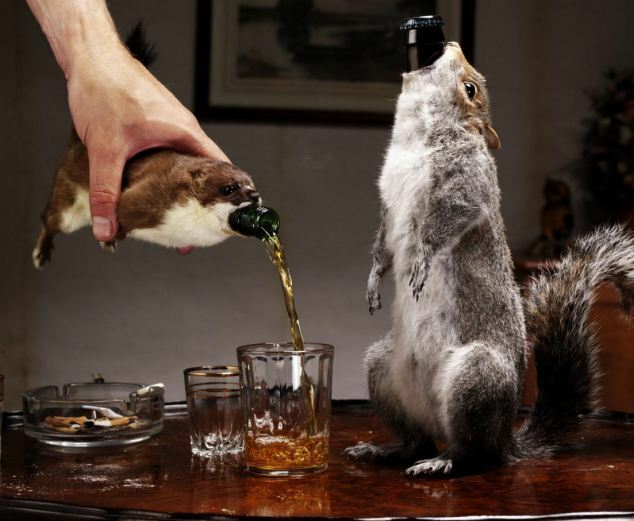 BrewDog has (at least the cap, I’m not sure if their name is on the squirrel). Brewers shouldn’t have to defend their product, it should speak for itself…maybe it does in this case. I think it does speak for itself, and that’s why I want nothing to do with these guys. It’s interesting to hear your comments on their high abv beers, because I’ve never had them. Although I have had their Tokyo (a weak 18%) and I actually thought it was really interesting; hard to drink much of it, but at least it was different and mixed a lot of complex flavors. Also, they have done some pretty good team ups with Stone and Mikkeller lately. I’m not ready to write them off as brewers completely – so long as they get back to actually making beer. I felt the same way when they launched Tactical Nuclear Penguin – I wasn’t ready to write them off, but I was suspicious of the direction they were heading with their brand. It was then that I tried their beers to see what their regular stuff was like. It was pretty good, but not amazing and I wasn’t wowed by anything. I tried to keep an open mind, even after Sink the Bismark came out. But stuffing a 55% ABV beer into a dead animal absolutely seals the deal for me. I’m done with these guys. I’m not sure that Brewdog is in the industry to brew beer or what. Seems like the only time you read/hear about them is when they do something controversial. Like Jim, I was not impressed with the beer I’ve tasted so this story makes me want to completely ignore any of their offerings. There are other of brewers who are serious about their product – I will drink their stuff, thank you very much. Fingers crossed that the site is up when folks click the link!! Really stinks. Are you guys back up and running? I know that these guys love pushing the boundaries and putting on the “bad guy” image….is it any wonder that they are such good friends with Mr. Stone Greg Koch of “You are not worthy of our badass beer” Stone. I’m not ripping on Stone, or Brewdog, I’m just saying they chose an image for their beer for marketing reasons (everybody DOES have to market to an extent) and they chose an image with intrinsic risk. I loved Buckbeans un-labeled stark silver can of maibock for that reason…the focus was ONLY on the contents. Anyhow, I’m with you…I’d be very intrigued if guys like Avery, who’ve put their legwork into the industry, created an extreme beer. I agree that these guys have a flair for PR stunts, but what is it doing to their brand? Is what they’re doing interesting and irreverent? Yes. But they’re playing with fire as well. We’ll see if they wind up becoming a punchline or a huge success. It certainly seems to me that they thrive on attention, and they might be sacrificing the long term stability of their brand for short term press coverage. Yup, back up and running…just had to wait for hostmonster to fix whatever the issue was. Hooray! Thank Heaven for Servers That Work! Maybe they’ll change their site to that name, or perhaps that could be the name of the brew pub portion of their brewery.